Elda Ltd. - Stay healthy with Izy Vape! It's not secret anymore that more and more smokers are switching to e-cigarettes vaping either e-liquid or CBD. 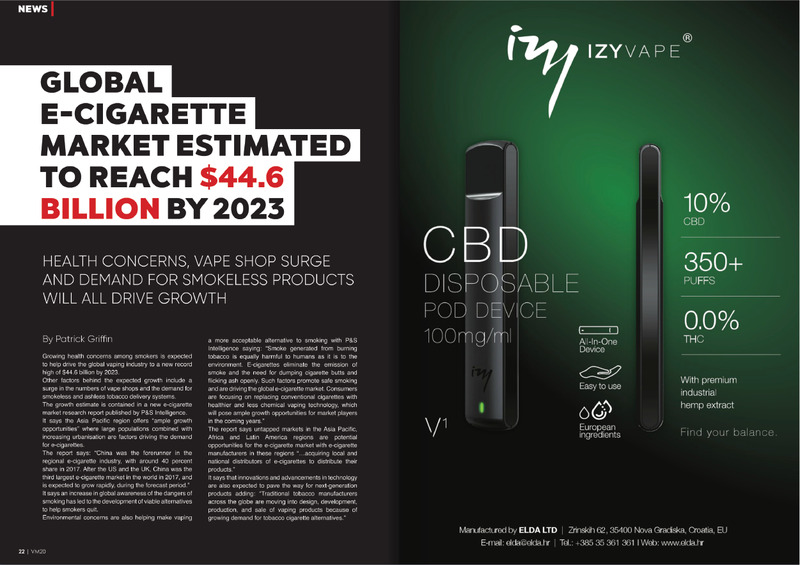 As stated in the article from popular and reputable Vaporound magazine where our IZY POD advert came out, smoke generated from burning tobacco is equally harmful to humans as it is to the enviroment. Users recognized importance of not only their own health, but also enviromental health also, which is leading e-cigarette market to bloom. Acording to research, e-cigarette market is estimated to reach $44.6 billion by 2023., and CBD market will hit $22 billion by 2022. CBD, a non-psychoactive cannabinoid found in cannabis, has had a surge in popularity over the past couple of years. Unlike THC, the chemical compound that gives weed its signature effect, CBD has been shown to help with everything from PTSD and anxiety to MS— without getting you high. You can find CBD now in various types of products, including capsules, honey, face masks, water.. But the most effective way of apsorbing CBD is by vaping it. We have created IZY Vape POD to make vaping CBD easy to new users and for those who already vape to experience CBD in best way possible. You can do something great for your health today, choose to vape IZY CBD!